Why Cobinhood is a good buy right now! Nov. 14 official launch date! Cobinhood is a digital currency exchange that, as you may have guessed from the name, promises to steal from the rich and give to those in need. To achieve that goal, Cobinhood promises zero trading fees. Specifically, Cobinhood promises to offer zero trading fees for spot trading and margin trading up to 10x leverage. At the same time, Cobinhood is developing an ICO underwriting service. Companies – including new blockchain startups and existing enterprises – can launch an ICO through Cobinhood and enjoy compliance testing, security auditing, and other services. The company’s token sale for COB tokens is taking place throughout September and October. The general ICO begins on September 13 and lasts until October 22. 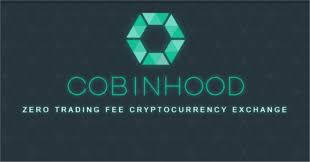 The company will launch its cryptocurrency exchange on November 14 according to the official website https://faq.cobinhood.com/general/open-beta-launch-soon. I am personally excited about this new exchange because it is not only a great idea and has individuals running the company that have actually made investors money in the past, but it is something I will actually use myself. Now seems as though it would be the time to buy in BEFORE the launch of the actual exchange. Either way, this market hinges on news and the night before the launch it should go up enough to sell and possibly earn something.